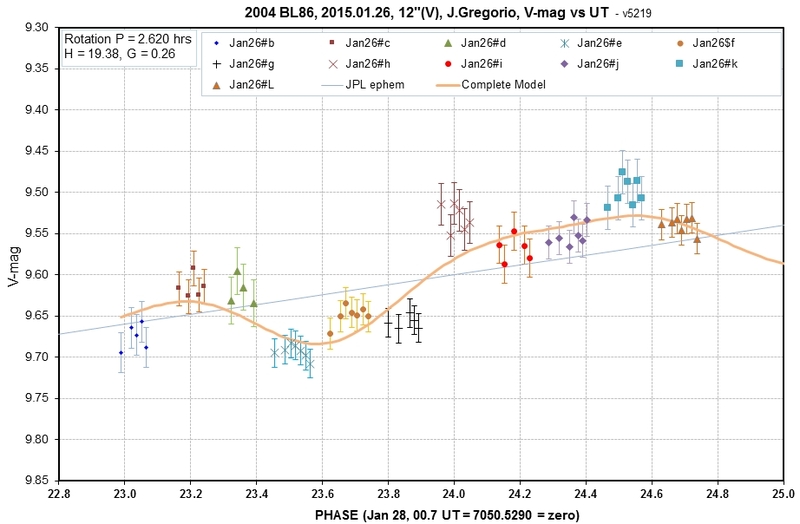 This web page reports results of an amateur observing campaign of NEA 2004 BL86 during its close pass in late January, 2015. The observations were requested by Dr. Vishnu Reddy, of the Planetary Science Institute in Tucson, and coordinated by B. Gary. Asteroid 2004 BL86 was observed during a 7-day interval starting 1/2 day before closest approach. The observers and observing situations are listed in Table 1. 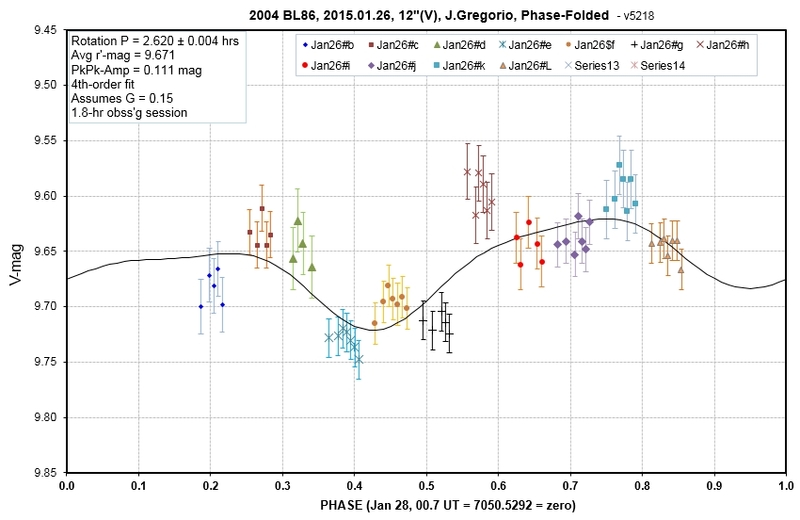 During the 7 days of observations 9 rotation light curves (LCs) were obtained; 7 of these were high quality and are shown as phase-folded LCs in Fig. 1. The rotation period adopted for phase-folding is 2.620 hours. 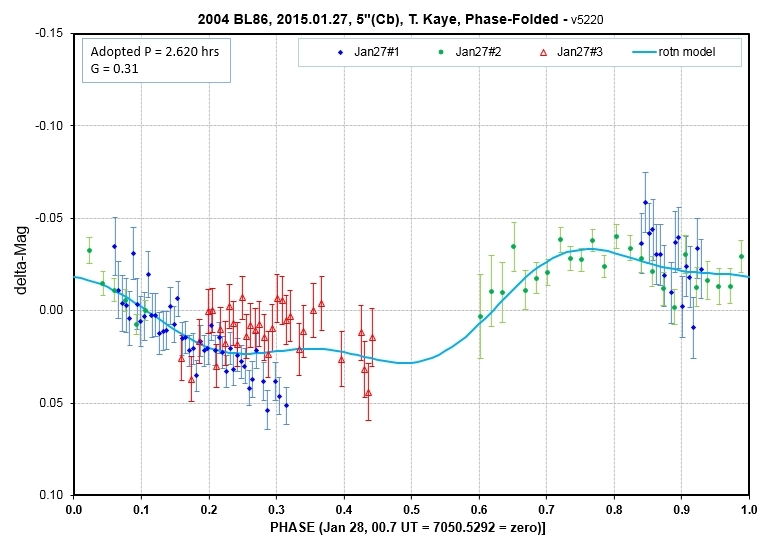 This period was determined from LC data with a precision that is much less than reported by Pravec et al (2015), whose value of 2.6205 ± 0.0005 hours was based on many observations from South America made prior to closest approach. Observations made during closest approach are unsuitable for determining rotation period because that's when rotation LC shape is expected to change the most due to changing viewing geometry (phase angle and distance to Earth). Indeed, although our phase-folded LCs exhibited gross properties that remained the same, new features appeared at the time of closest approach and are superimposed upon the gross shape. 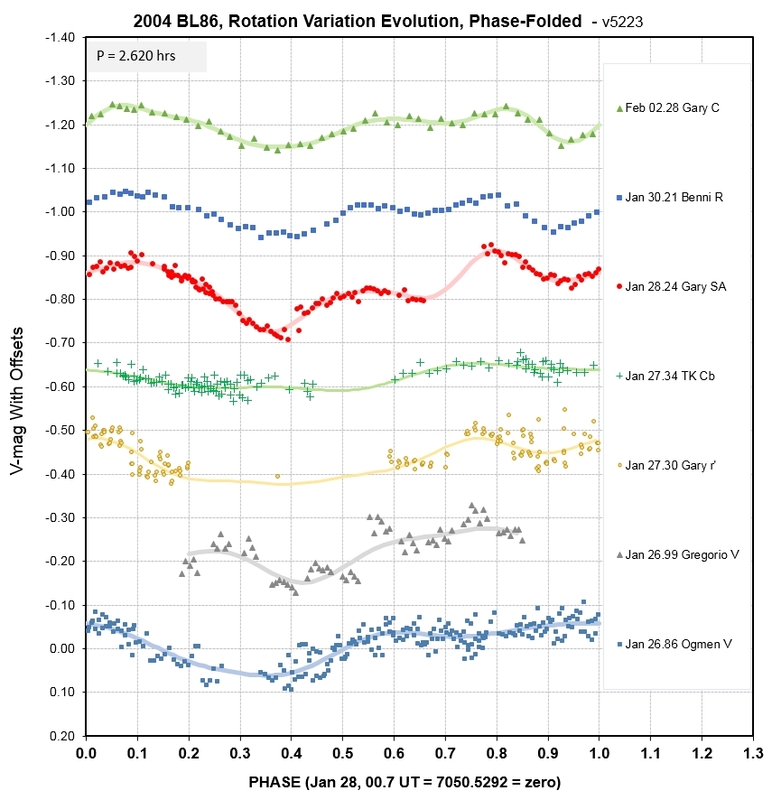 Phase-folded (rotation) variation evolution versus date. Earliest is at the bottom; opposition is 3rd from bottom (Jan 27.18). All phase-folded rotation LCs show a minimum at a phase ~ 0.35. Most exhibit a maximum at phase ~ 0.05. After closest approach a pair of maxima appear at ~ 0.55 and 0.80, replacing what was a broad bright interval (0.6 to 1.0) seen in the first LC (by Ogmen). Analysis of these changes in terms of asteroid shape and rotation axis orientation is complicated, and if there is a desire to perform such an analysis it should be done by one of the few people with experience doing it (e.g., Petr Pravec). If BL86 were a tumbler (with more than one axis of rotation) the rotation LC shape would not have been preserved as much as it was; BL86 is therefore not a tumbler. It is not necessary to have a solution for shape and rotation orientation in order to make use of these data; the evolving rotation shape can be used to predict what would have been observed at any specified phase angle for the purpose of creating a phase function curve. In creating a plot of brightness versus phase angle it is customary to adopt a rotation phase corresponding to maximum brightness, since minima vary more than maxima. 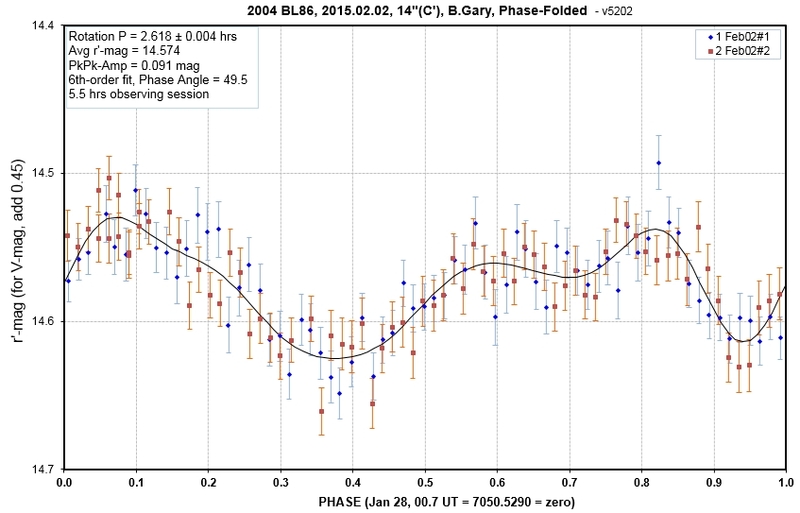 Phase angle (sun-asteroid-Earth) varied during our observations from 1.5 to 54 degrees. Four of the 11 observing sessions were made when phase angle was less than 7 degrees, so our data sampled the "opposition effect." Phase curve for all filter bands converted to V-band using SED information. Only measurements near rotation phase 0.05 are used, and they have been adjusted for their difference from rotation phase 0.05 using the rotation LC appropriate for the date (maximum adjustment was 0.06 mag). 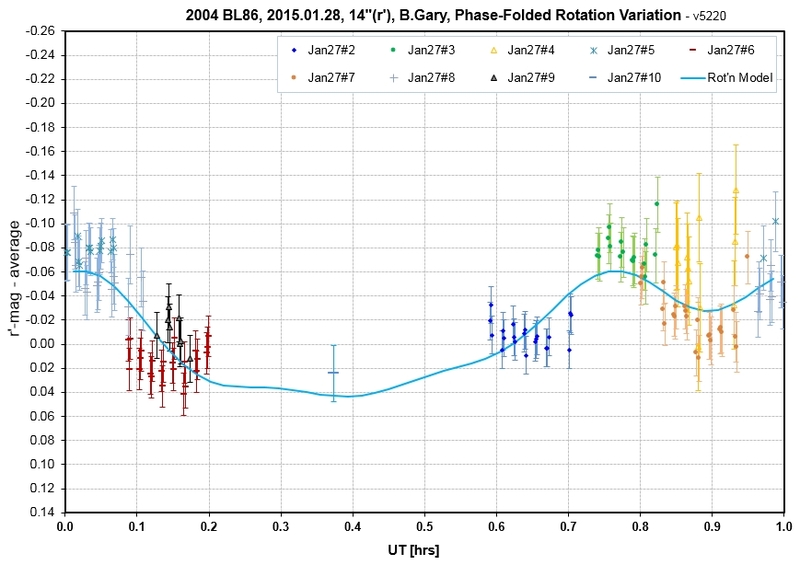 The "Gary Jan26" magnitude at a phase of 53.5 degree was categorized as an "outlier" for no known reason, and was not used in determining the HG solution. The uncertainties shown are stochastic only; systematic uncertainties are difficult to evaluate and they should be orthogonally added to the H value (negligible change is expected for the G value SE). The linear slope for phase angles > 10 degrees is +0.0262 magnitude/degree. Data labels convey information about what filter was used and what standard magnitude band they were calibrated for (details are given in the text). Same data as in the previous graph, but showing only the PA < 22 degree portion. This phase effect plot shows all measurements converted to V-band. When measurements were made with a r'-band filter, for example, the images were processed in a way that produced r'-magnitudes on the assumption that BL86 had a g'-r' color of +0.607 (derived below). Images made with a R-band filter were processed in a way that produced r'-magnitudes using the same BL86 color assumption. Clear filter images (and those with a "clear with blue-blocking" filter) were processed the same way, resulting in r'-magnitudes. The G filter observations (using a SBIG G band filter) were processed as if a V-band filter was used, assuming BL86 had a g'-r' color of +0.607. In other words, all images were processed using a process that was equivalent to applying "CCD transformation equations." Converting r'-magnitudes to a V-magnitude equivalent was achieved by adding 0.276 (derived below). 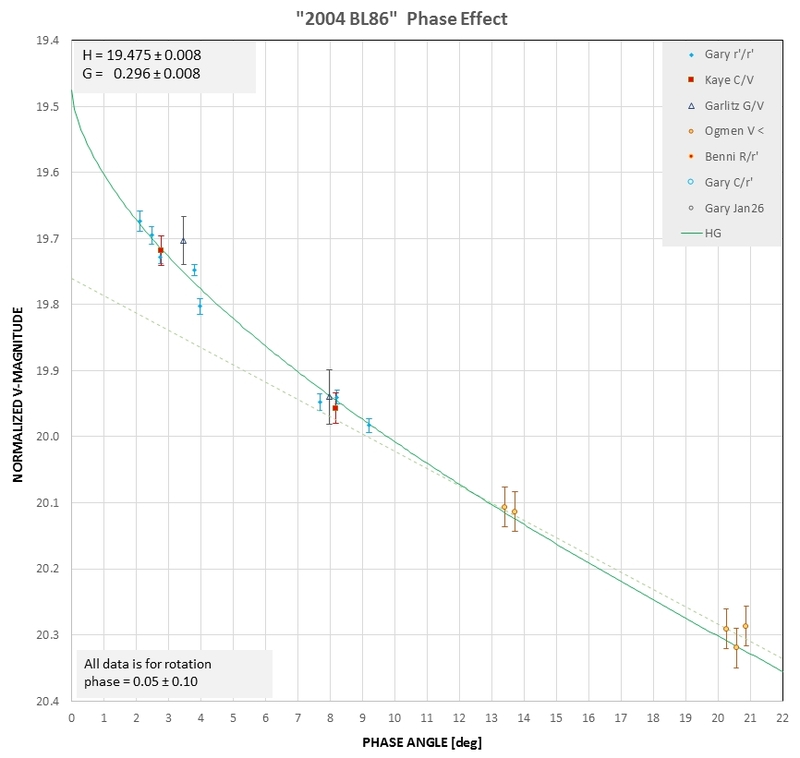 The phase effect plot uses labels meant to indicate which filter was used for the observations and which band was used for calibration. For example, C/V means that a clear filter (or "clear with blue blocking") was used for the observations and APASS V-band magnitudes were used for calibration. G/V means that a G filter was used and APASS V magnitudes were used for calibration. Due to space limitations some labels require additional explanation: the "Gary Jan26" data was r'/r', and the "Ogmen V<" data was V/V observed before closest approach. All data but one are compatible with the HG solution, with H = 19.457 and G = 0.30. The one "outlier" is the first measurement made by this northern hemisphere team, when phase angle was 53.5 degrees. 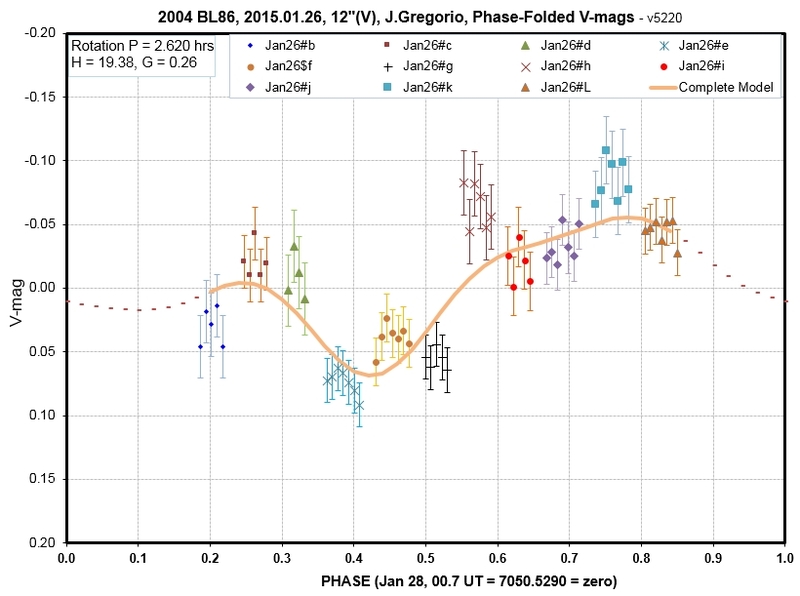 BL86 appears 0.30 magnitudes fainter than expected. The only explanation that I can think of to account for such a large discrepancy is that at the the time of this observation the secondary was being eclipsed. Even this explanation is unfeasible, because the secondary is too small. The JPL radar observers report sizes of 325 and 70 meters. The secondary has a solid angle only 4.6% of the primary, so if they have the same albedo an eclipse (and a transit) would produce a 4.6 % maximum drop in brightness (i.e., 0.051 magnitude). A 0.3 magnitude fade (i.e., fading to 0.76 of un-eclipsed value) would require that the albedo of the secondary be 5 times the albedo of the primary. But the primary has an albedo of 30%, so a 5-fold increase is impossible. This outlier datum remains a mystery. The Spectral Energy Distribution, SED, was obtained in two ways: 1) using g'r'i' filters and corresponding APASS magnitudes for background references stars, and 2) SA-100 transmission grating measurements calibrated using 3 solar analog stars. Both measurements were made on January 27 by B. Gary. Spectral Energy Distribution, SED, based on SA-100 transmission grating and g', r' & i' observations. Open circle symbols are fictitious measurements forced to match the SA-100 spectrum and used to determine colors for standard filter bands. The g'r'i' and SA-100 measurements were made 2 hours apart, and an adjustment of the fluxes corresponding to the g'r'i' measurements was made to compensate for the changing Earth/asteroid distance. These two types of measurements exhibit very good flux spectrum agreement. where Fa = flux of the asteroid scaled to 1 a.u., Fs = flux of the sun at 1 a.u., r = distance of the asteroid from the sun in a.u., d = distance of the asteroid in km, and Ra is radius of the asteroid in km. Since flux appears as a ratio in this equation it doesn't matter which units are used (W/m2/micron or watts/m2), provided they're the same. Albedo was then converted to geometric albedo, the albedo that would be measured if viewing geometry permitted a measurement at zero phase angle, using G = 0.296 ± 0.001. The resulting geometric albedo spectrum is shown by the green open squares in the next graph. Geometric albedo as measured on January 27, 07:15 UT (lower set of symbols), and adjusted to show what would have been measured if BL86 had been at a rotation phase corresponding to maximum brightness (upper set of symbols). The uncertainty of the symbols between 450 and 900 nm is ~ 1% in albedo terms, or 3% as a relative uncertainty. The lower set of symbols in the above graph is geometric albedo for the specific time of the SA-100 measurements, which was at a rotation phase of 0.35, when BL86 was at minimum brightness during a rotation. On this date is it estimated that maximum rotation brightness was ~7% greater, which corresponds to the upper set of symbols. BL86 is very red, with B-V = +0.95 (compared with B-V = +0.64 for the sun). This SED was used to determine how to convert r'-mag and R-mag to V-mag. For example, as the information window in the above figure shows, to convert r'-mag to V-mag add 0.276. The BL86 SED in the above figure exhibits the short wavelength side of the Band I absorption feature. This is better illustrated by the next plot, showing the BL86 geometric albedo spectrum. The geometric albedo of 2004 BL86 resembles Vesta in two respects: 1) albedo is high, and there's a strong Band I absorption feature at ~920 nm. Both spectra were made using the same SA-100 transmission grating. The BL86 geometric albedo corresponds to maximum brightness during a rotation. This is in excellent agreement with Ag determined from the SA-100 SED, where Ag = 26 ± 1 %. Therefore, BL86 constitutes one example of a small asteroid obeying the slope/albedo relationship suggested by B&S. In the same article B&S also suggest a relationship between the size of the "opposition effect" (OE) and albedo. B&S use the definition of OE as the difference in V-magnitude between phase angle = 0.3 degrees and the linear slope fit at the same phase angle. For BL86 we show a difference of 0.233 ± 0.010 magnitude. The B & S relationship predicts 0.35 ± 0.05 magnitude for Ag = 28 %. 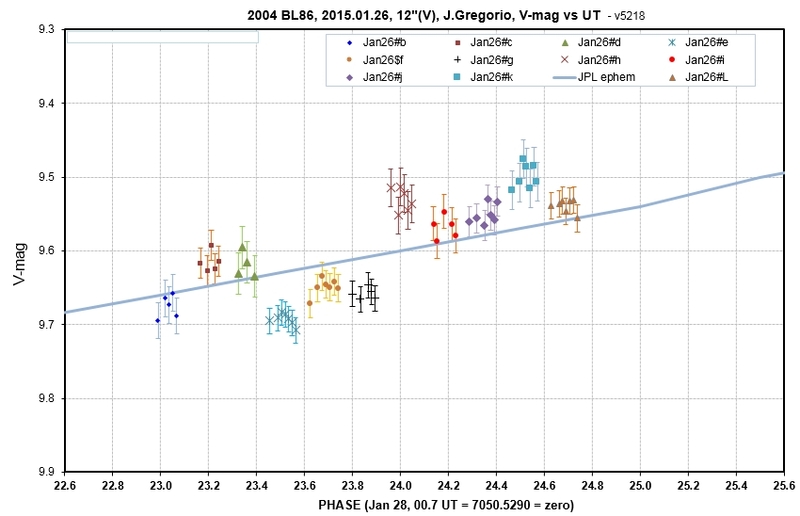 Therefore, BL86 has a smaller OE than predicted by B&S (0.23 ± 0.01 vs. 0.35 ± 0.05). BL86 therefore is one example of a small asteroid that does not obey the B&S OE/albedo relationship. The following observers contributed to this observing campaign. All are amateurs except for Dr. Vishnu Reddy and Dr. Karsten Schindler. Figure 1. 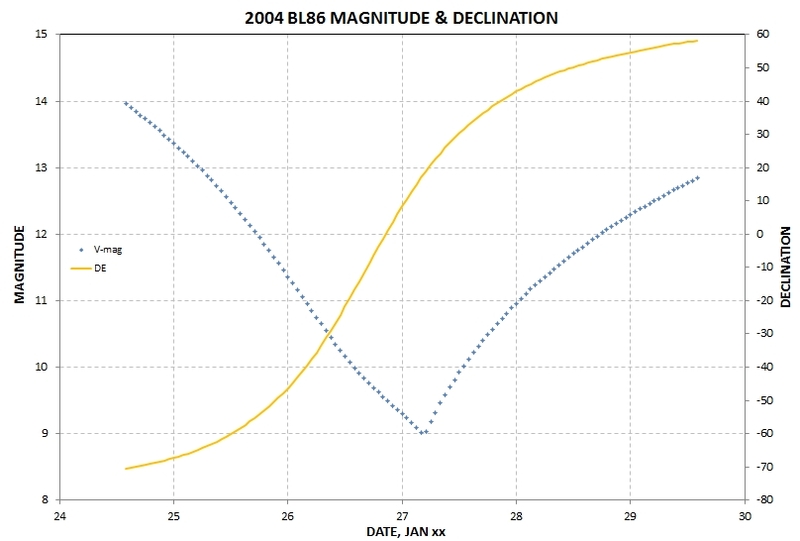 Magnitude and declination for Jan 24 to 29 (UT dates). For an observer at latitude of +30 deg, for example, where the southern-most observable object is at DE = -40 deg (EL = 20 deg), BL86 wasn't observable until Jan 26.2. Yenal Ogmen, in Cyprus, was probably the first northern hemisphere observer to observe BL86. 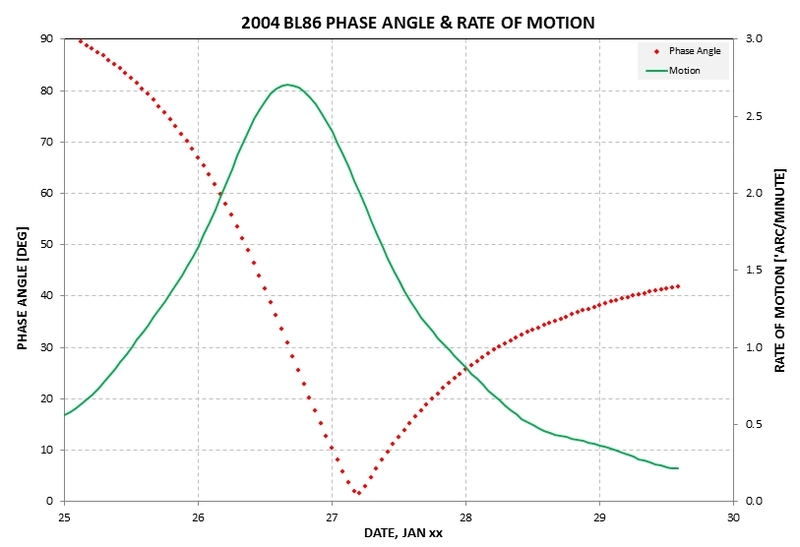 The next graph is another overview, showing phase angle and rate of motion versus date. Figure 2. Phase angle and rate of motion for Jan 25 to 29. Since northern hemisphere observers were limited to a phase angle coverage of ~ 48 degrees to 2 degrees. 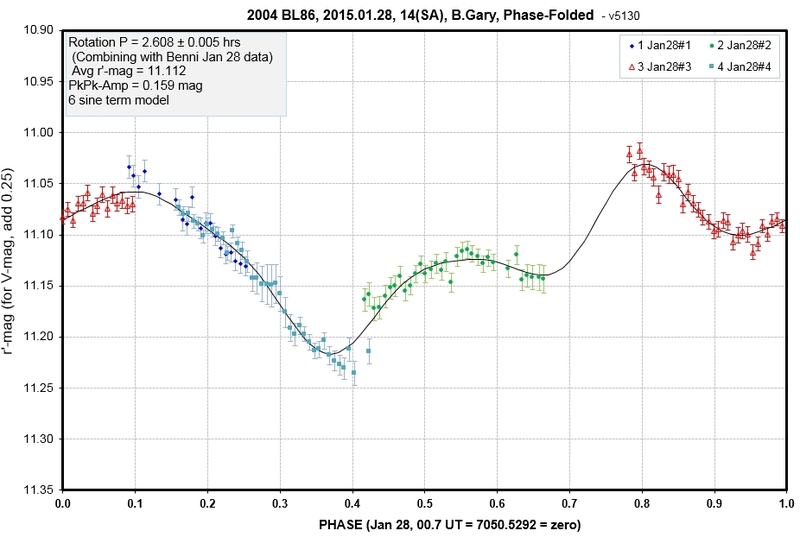 Those all-important small phase angle observations, e.g., under 10 degrees, were confined to Jan 27.00 to 27.45 UT. European and USA observers were well-placed for these observations. Observations were obtained by T, Kaye (0.5 hr, 5", Cb filter), B. Gary (0.5 hr, 14", g'r'i' filters), J. Garlitz (0.5 hr, 12", G filter), Y. Ogmen (4.5 hrs, 14", V filter) and J. Gregorio (1.9 hrs, 12", V filter). Opposition (smallest phase angle) and brightness maximum occurred at 4.5 UT on the following date (Jan 27). The T. Kaye observations with a 5" telescope have not been processed, partly because the SNR is expected to be much lower than the simultaneous observations by B. Gary with a 14" telescope. Both observatories (located a few miles from each other) were under cirrus overcast except for a brief 1/2 hour clearing. During a brief clearing, when EL = 25 deg, these 3 FOV measurements were made of r'-mag. Y. Ogmen observed 37 FOVs with a V filter. APASS V-mags for 3 or 4 background stars in each FOV were used to calibrate each FOV. Internal consistency between reference stars was used to identify outliers, and the remaining stars were then used to re-calibrate the FOV. The LC below is probably the first by a northern hemisphere observer. V-mag vs. UT, by Y. Ogmen, for 36 FOV image sets, using 3 or 4 background reference stars. 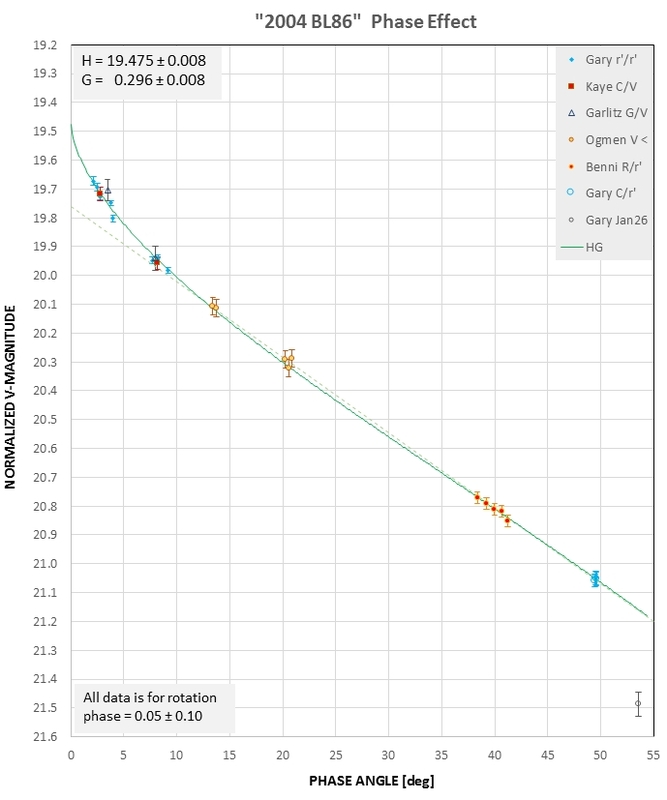 The blue trace is a JPL Horizons prediction (using Earth/asteroid distance and HG phase model, with G = 0.15). J. Gregorio obtained 11 FOVs with a 12" using a V filter, from 22.99 to 24.74 UT, when BL86 was approaching opposition (at 4.5 UT, Jan 27), and was therefore experiencing almost a full amount of "opposition effect." A total of 166 background stars were used for reference (avg of 15 per FOV), with APASS Vg'r' magnitude readings (using C2A) to establish a "star color sensitivity" relationship for this telescope system. A BL86 g'-r' star color of +0.607 was adopted for mag offset adjustment. In spite of these precautions there is an unexplained "scatter" of FOV-average V-mag that implies the presence of a FOV systematic SE of typically 20 mmag. Image processing is mostly done; below are plots of V-mag vs UT and a provisional plot of V-mag adjusted to a standard UT vs rotation phase (with an adopted model for G=0.15). 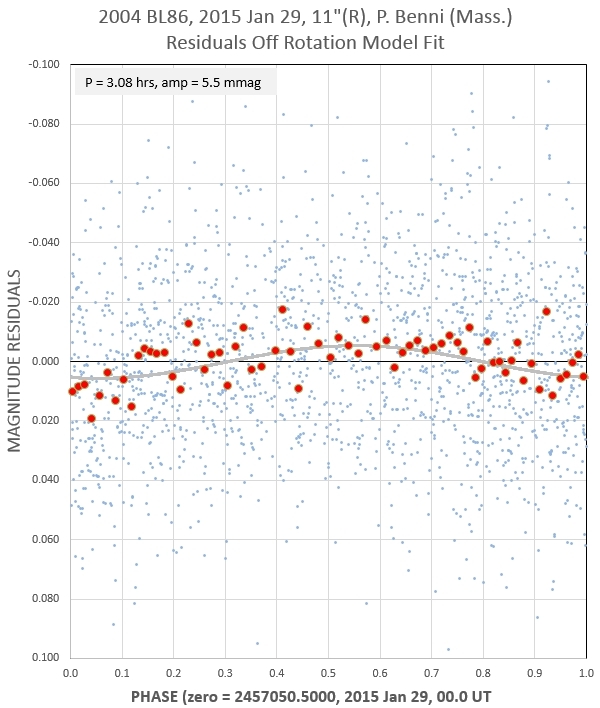 V-mags compared with an ephemeris prediction (using G = 0.15) for 11 FOVs. Rotation LC for a 1.8-hr observing session with 11 FOVs, using an adopted model with G = 0.15. It's risky fitting data that doesn't last longer than the rotation period. V-mag vs UT with a model fit that includes all 3 components of variation (distance, phase effect and rotation). V-mag vs phase, showing only the rotation component of variation, with the other two components subtracted (distance and phase effect). The above graph lacks measurements near zero phase, so unfortunately none of this data can be used for the phase effect analysis. Observations by J. Gregorio that began on Jan 26, 23 UT, extended to Jan 27, 01 UT (described above). T, Kaye (4.5 hrs, Cb filter), B. Gary (2.0 hr, g'r'i' filters plus 3.0 hrs, SA-100 transmission grating) and J. Garlitz (3.3 hr, G filter). This is the date of closest approach, smallest phase angle and maximum brightness (4.5 UT); it is a time when Earth-asteroid distance, d [a.u. ], and phase angle, were changing fast. Therefore brightness was changing rapidly due to 1) changing Earth/asteroid distance, 2) changes due to phase effect (as modeled by HG), and 3) rotation variation. Because of these simultaneous changes the usual method of phase-folding to obtain a rotation LC was unreliable; instead, it was necessary to create a model for brightness vs. UT and model fit measurements with this model, allowing all model parameters to be solved for simultaneously. This was a new processing challenge for me, which required some floundering before I realized such an approach was necessary. B. Gary began g'r'i' observations with a 14" telescope with a HyperStar prime focus lens at 02 UT, when EL = 12.5 deg; but these data were of poor quality due to high air mass and intermittent cirrus. A clearng began at 05.2 UT, and g'r'i' observations resumed. 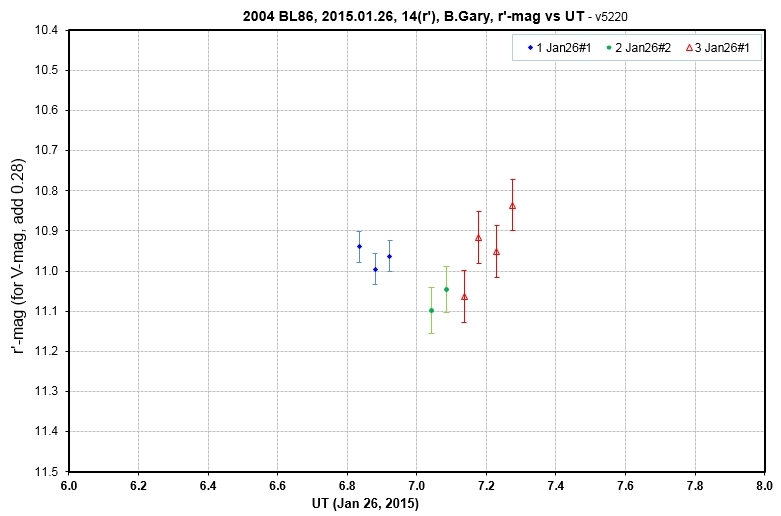 At ~ 07 UT SA-100 observations began, alternating between BL86 and 3 sun-like calibration stars. At 08.3 UT observations returned to the g'r'i' mode. The return of clouds ended observing at 09.5 UT. All r' and some of the g' & i' have been processed. Some of the SA-100 observations have been processed. The next set of graphs illustrate the complicated nature of analysis of the Day#2 measurements. 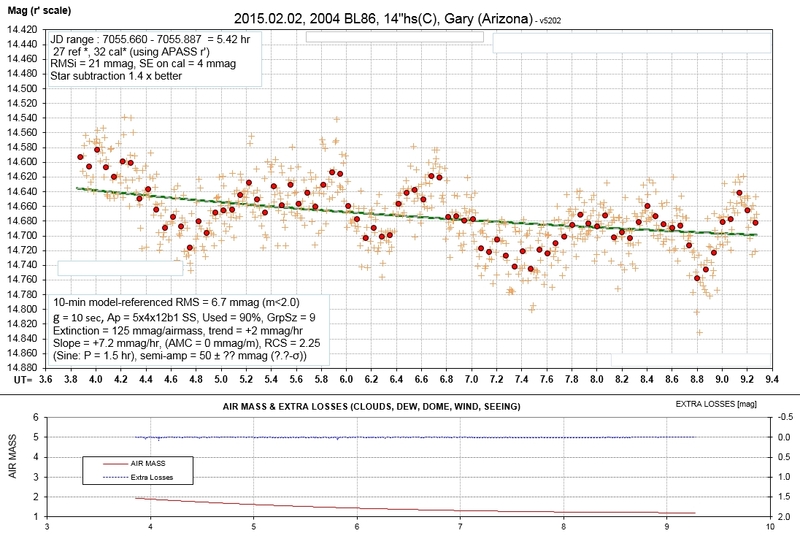 LC by B. Gary with a 14" telescope and r' filter, showing r'-mag vs. UT for most of a 4-hour observing interval. The green dashed trace is the JPL Horizons prediction; the black dashed trace is my version of this using a fitted HG model. The two dashed traces account for only changing Earth/asteroid distance and changing phase angle (using an HG phase function). The wave blue trace is a rotation model superimposed upon the black dashed trace trace (with G = 0.28). Same data as above, but after removal of the models for changing Earth/asteroid distance and phase effect, showing only a rotation variation. Same data as above but phase-folded using a period of 2.62 hours and a 4-sinusoid term rotation variation model fit. Because so many model parameters had to be fitted simultaneously, and because there is a large gap in the measurements, the above "rotation LC" (i.e., phase-folded LC) is not well determined. It can be used in a limited way to evaluate gross changes to the rotation LC as BL86 went through an arc in the sky ~ 90 degrees long. The data gap seen in the previous graphs was due to switching from use of g'r'i' filters to use of the SA-100 transmission grating. 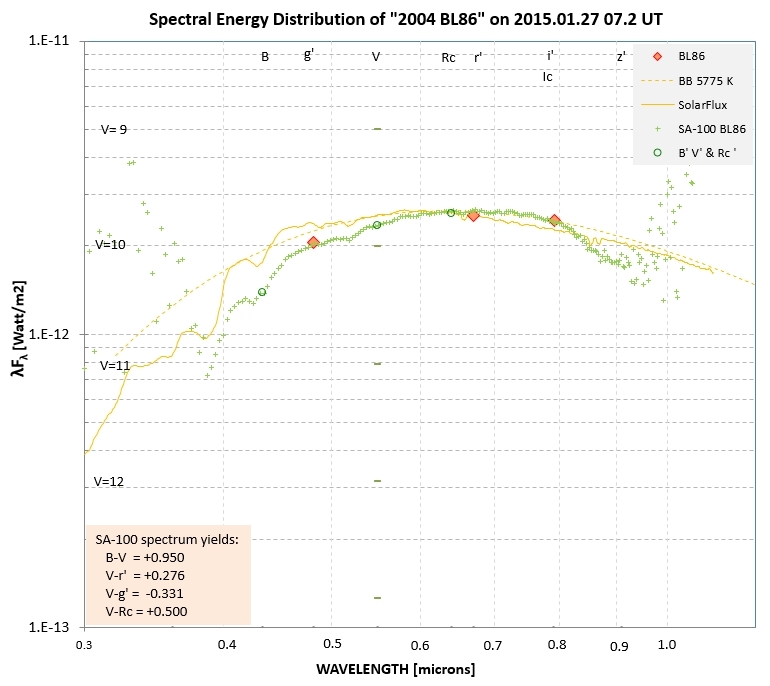 Flux spectra of 3 solar analog calibration stars and BL86, compared with a re-scaled solar spectrum. 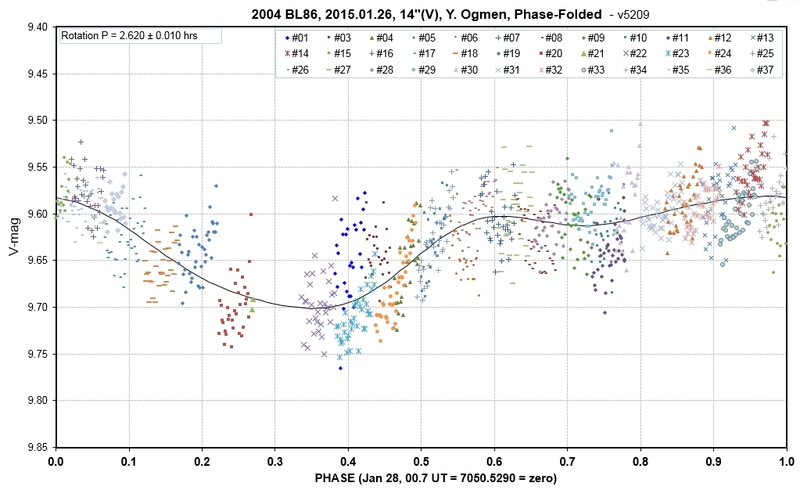 Geometric albedo for the average BL86 flux estimates is shown. Geometric albedos of BL86 and Vesta (using the same SA-100 transmission grating). The SA-100 measurements were calibrated using the solar analog stars at 08:47:07 +28:9:43 (G2IV, V = 6.61), 08:51:01 +15:21:02 (G1V, V = 6.39) and 09:48:35 +46:01:15 (G0.5Va, V = 5.12). The observing sequence was the usual one for minimizing atmospheric extinction trends: star1, BL86, star2, BL86, star3. The air mass values were all < 1.05. The average BL86 measurement was when phase angle = 5.4 degrees. An adjustment to zero p hase angle using G = 0.30 was made. Based on the internal consistency of the 3 calibration stars it is estimated that the relative uncertainty was <3% between 450 nm and 900 nm. This uncertainty is much greater than the uncertainty associated with G, so when a geometric albedo is given as 30.0% it is uncertain by ~ 1%. For example, at 750 nm geometric albedo Ag = 30 ± 1 %. A diameter of 325 meters, based on preliminary radar results (Benner, 2015), was adopted; this may actually be a larger source of uncertainty for Ag than those associated with the SA-100 observations. BL86 and Vesta are both high albedo asteroids, and they both exhibit the Band I absorption feature at ~ 920 nm. BL86 is redder than Vesta. The T. Kaye 5" telephoto lens has a 6x6 degree FOV, so even though BL86 was moving fast on this date it was necessary to use only three 3 FOV placements for this 4.3-hour observing session. A Cb filter (clear with blue-blocking) was used with 15-second exposures. Due to intermittent cirrus clouds useful imaging could not begin until ~ 06 UT (11 PM local). After ~ an hour a return of cirrus interrupted observing for almost an hour. This was followed by a clearing lasting ~ 2.5 hours, which ended with the return of cirrus at 10 UT. Stars brighter than about 10.2 suffered from ghosting, causing them to appear brighter than actual, so only fainter stars could be used for calibration. Since limiting magnitude for the 15-second exposures was ~ 16, there were plenty stars available; for the 3 FOVs, 24, 35 and 35 calibration stars were used. Star color sensitivity plots showed that small corrections for star color were required when comparing instrumental magnitude with APASS V-mag. Star color was represented by g'-r', which for BL86 was determined to be 0.607 (by B. Gary g'r' observations, and corroborated by SA-100 spectra). 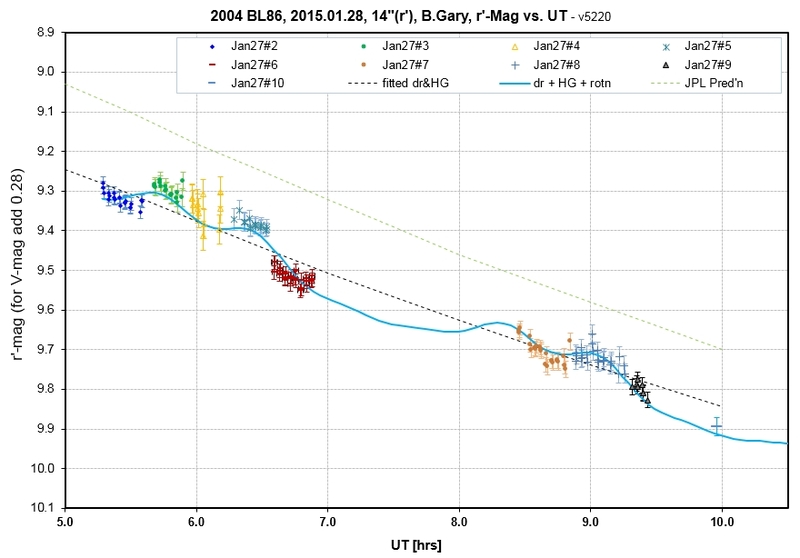 The following graph shows T. Kaye's V-mag vs. UT for the Jan 27 observing session. LC by T. Kaye using a 5" telephoto lens and CCD camera (FOV = 6x6 degrees), requiring only 3 FOV placements. 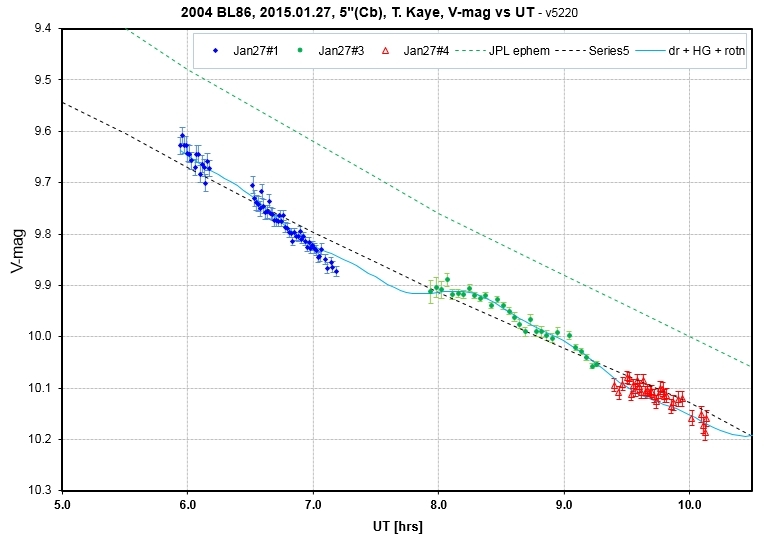 The green dashed trace is from the JPL Horizons ephemeris. The black dashed trace is my revision (including only changing geometry and HG phase function). The wavy blue trace has a rotation solution (given below) superimposed. The data gap at ~ 7.5 UT is due to cirrus. Same data, but with the changing distances and HG phase function removed. Phase folded version of data in previous figure, with a 4 sine component fit. J. Garlitz observations were made with a 12" telescope with a G filter from 04 to 07.5 UT. Processing continues. So far, we have V-mag = 9.46 ± 0.02 at 04.25 UT, plus some lower quality V-mag's afterwards. Below is a plot of G-band and C-band data, calibrated with stars APASS V-band. J. Garlitz light curve for 6.2-hours of observations, beginning with G filter (up to 7.5 UT) and continuing with clear filter. 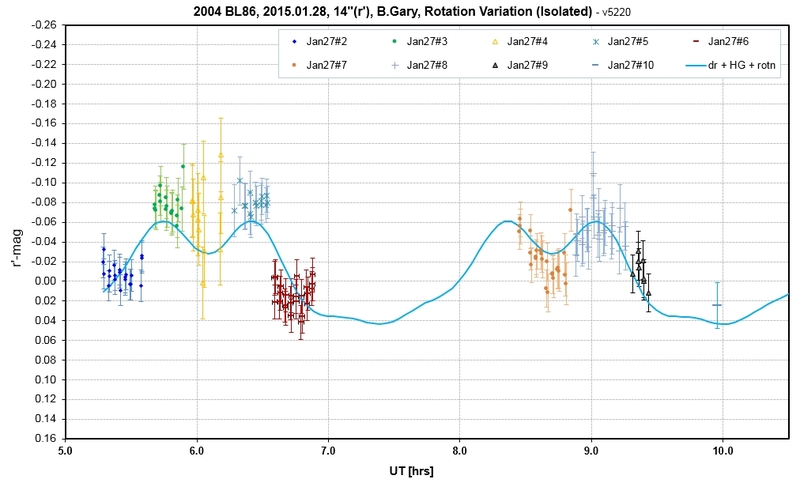 The wavy gray trace is the same model determined from B. Gary r'-band observations made at the same time. 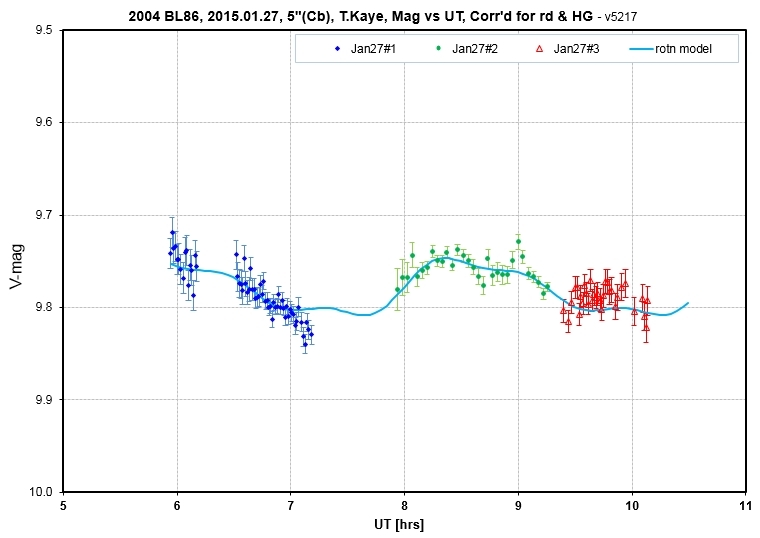 The above data is in agreement with the B. Gary r'-band data from the same date; since it is noisier there has been no attempt to improve the model fit. 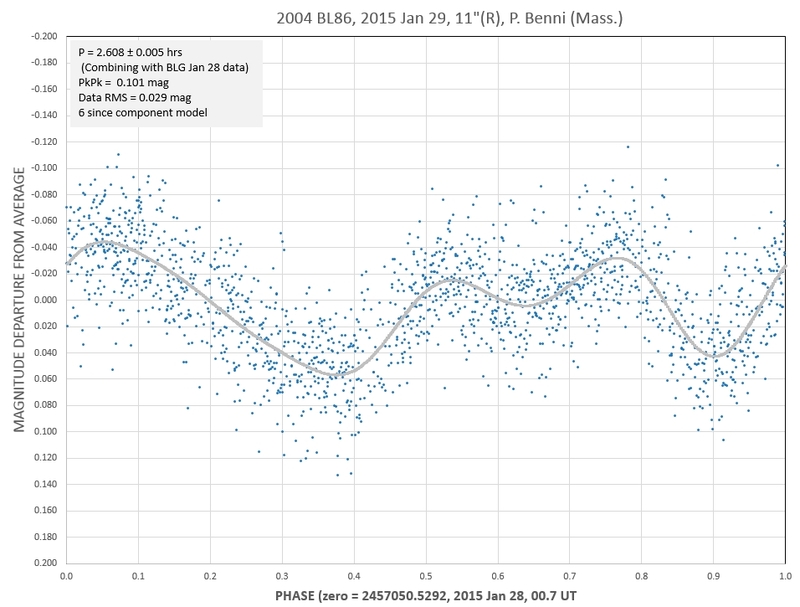 However, measurements made near 6.4 and 9.1 UT are close to rotation phase 0.05 so that data will be used in the phase curve plot. B. Gary observed with the SA-100 for 3.5 hours on this date. The zero-order images of BL86 were processed as if they were unfiltered, and this risky procedure led to the following phase-folded LC. P. Benni "dug out" from a snowstorm to observe for ~ 11 hours with a 11" Celestron and R filter. P. Benni measurements showing effects of changing Earth/asteroid distance and rotation superimposed. Same data after removing effect of changing Earth/asteroid distance and phase-folding. P. Benni's Jan 29 data has residuals off the 2.608-hr rotation model that exhibit a 3.08-hr variation, with semisamplitude 5.5 mmag, as shown by the graph below. THis might be due to the rotation of the smaller of the binary components. So far we haven't seen any "mutual events" (transits, eclipses or shadow fadings), so apparently the binary orbit spin axis wasn't oriented in a favorable way for such events to be seen from Earth at our observing times. 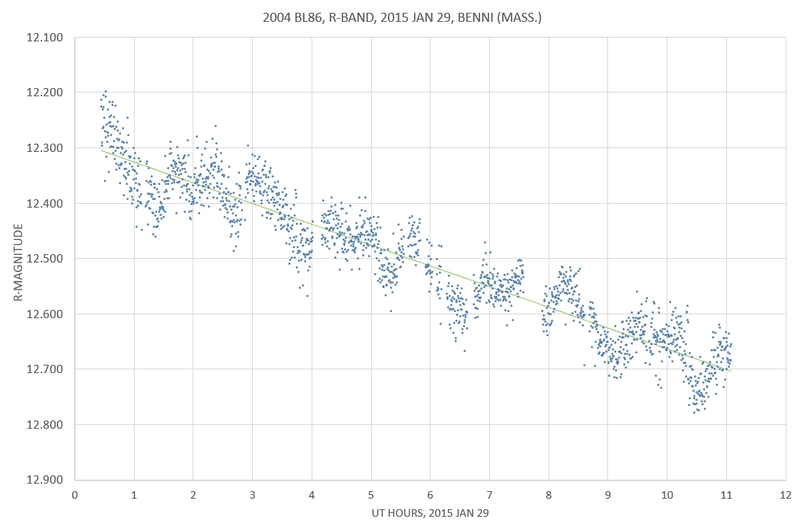 P. Benni's Jan 29 R-band data, a continuous run lasting 10.7 hours, provided an excellent solution for rotation period. I used it in combination with my Jan 28 data (3.6 hrs) to refine the rotation period even further. Below are both data sets plotted as a phase-folded LC. Rotation P = 2.608 ± 0.005 hours. A slight difference in the phase-folded LC shape can be expected due to the different observing geometry, being one day apart. Residuals off the previous fit can be used to search for an additional variation caused by rotation of the secondary. 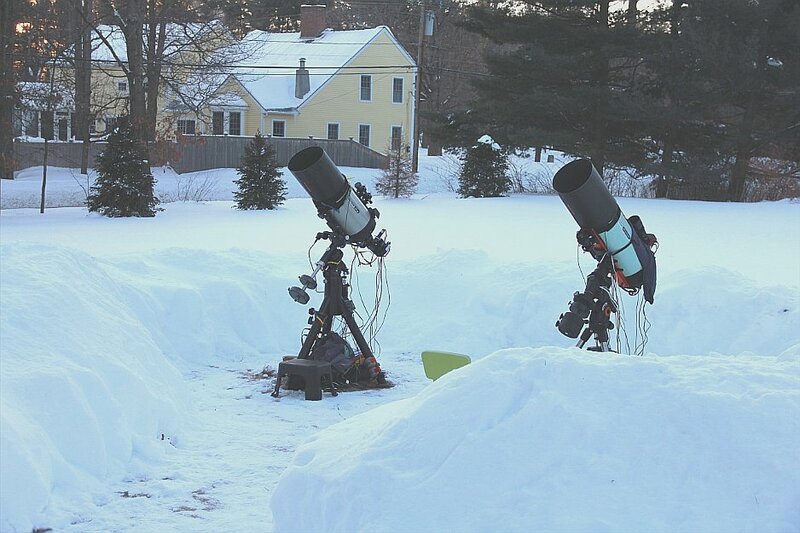 P. Benni's set-up during the Jan 29 observations, after digging out from a 30-inch snowstorm. On left is a Celestron RASA 11" f/2.2, with an SBIG ST-8300M CDD, providing a 1.67x1.26 deg FOV with 1.8 "arc/pixel resolution. This is the telescope used for the BL86 observations. B.Gary observed for 5.5 hrs (2 rotations), and obtained a phase-folded LC that matches the other ones. This means that BL86 is not a "tumbler." Two rotations LC when BL86 was far away and brightness changes were due mostly to rotation (not phase angle changes or distance change). Phase-folded version of the above (allowing for changes in distance).